It is unusual but not unprecedented for a house built by a prosperous Elizabethan family to remain in the ownership of the builder’s descendants for almost 300 years. 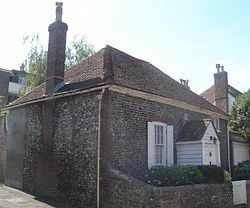 Malcolm Kitch, formerly Reader in History at the University of Sussex, will talk about one such house that remains a prominent Lewes landmark, albeit currently in a somewhat distressed state, and about the personalities and lives of the family who occupied it from 1572 to 1859. William Newton came from Cheshire about 1540 to establish the Southover branch of the family. He initially lived in the former Priory, and used Priory stone to build the Grange. Although they were the leading Southover family, they were also London lawyers for a century and a half, so spent only part of the year in the Grange. The Grange, with its 14 acres of grounds, was the largest and grandest house in Southover. The family also owned land outside Lewes, but they never became large landowners. The second William Newton was a leading Puritan during the Civil Wars of the mid 17th century. In 1760 the fifth William, and the last male Newton, followed his father into the army and rose to command the 10th Dragoons, the Prince of Wales own regiment. William regarded Prinny as a friend and the Prince stayed at his house in the early 1790s. William’s marriage to the tactless Elizabeth Knatchbull established a connection with Jane Austin. William’s niece Elizabeth was the last of the family. She married William Courthope Mabbott, an interesting and colourful character who took an active, if controversial, part in local affairs. 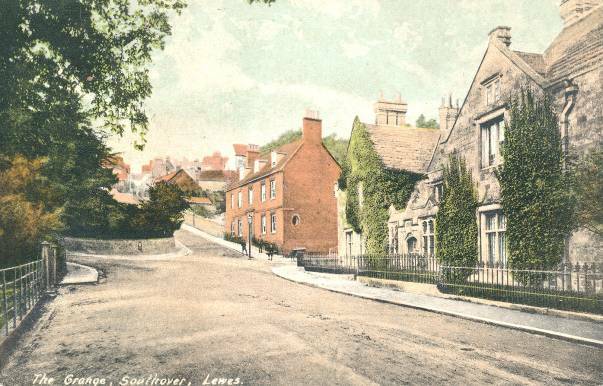 The illustration featuring Southover Grange is from an Edwardian postcard published by A.H. Homewood of Burgess Hill. It was posted in 1908 by a Mr Steinhaeuser of St Andrews, Lewes, to a Mrs Mason staying at a Paris hotel. We shall be serving coffee and biscuits prior to the meeting. Our membership secretary Neil Merchant reports that, against a final 2013 History Group membership of 173, we already have 165 members for 2014, including over 30 new members. Our hope is to reach 200 this year. 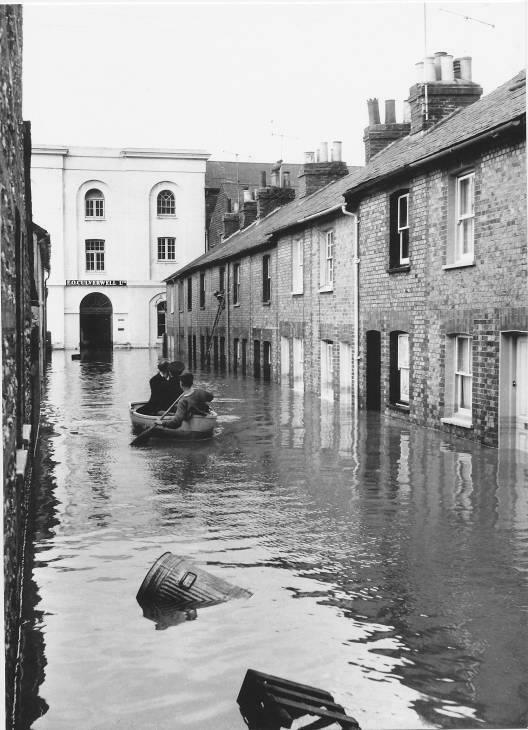 A delivery van and a Land Rover navigate the floods on Malling Street, passing the Wheatsheaf Inn, owned by Beard’s Brewery. This snippet of local news shows that the 18th century Baptist chapel on Eastport Lane was still going strong in 1811. I can’t immediately identify the chapel opened by the Rev M’Culla in this year – presumably it was one of the several early-19th century chapels opened to serve the soaring population of St John-sub-Castro parish, rather than St John’s, Southover. The chapel on Eastport Lane, now a cottage. 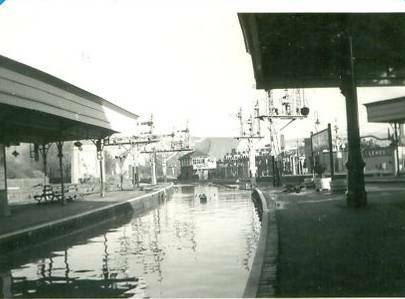 The Town Clerk (Mr M.S. Blaker) read the following letter to a special meeting of Lewes Town Council held on 25 September 1888 chaired by the mayor, Alderman Farncombe, and attended by Aldermen Kemp, Crosskey, Buckman & White and Councillors Fairbrother, Barber, Flint, Pelling, Hammond, Povey, Hobden, Douglas, Elphick, Hayler, Hillman, Barrett, Brook and Broad. Owing to being exposed to view at a comparatively small elevation just above the roadway, the effect produced by the bells is not so satisfactory as could be wished. Surrounding buildings break up the sound in various ways, according to the direction of the wind, and it is a matter worthy of consideration if a great improvement could not be made in the belfry, at a small expense, whereby a somewhat modulated but unvarying volume of sound would be heard. 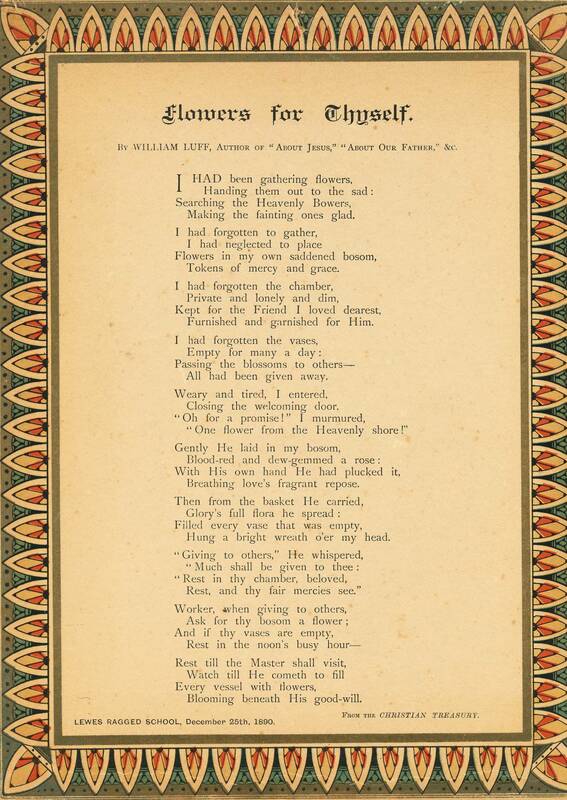 This elaborately decorated and quite sophisticated poem by William Luff, taken from the Christian Treasury and dated Christmas day 1890, was specially printed for the Lewes Ragged School. One wonders what today’s primary school pupils would make of it. 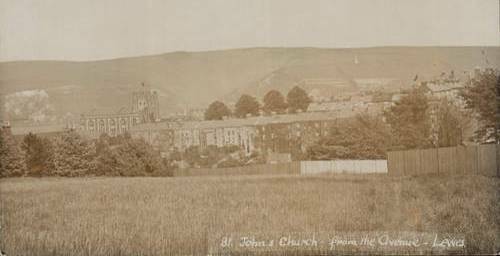 This Edwardian postcard (entitled ‘St John’s Church from the Avenue, Lewes’) shows the view from the Wallands, already beginning to be fenced off by new development, towards St John-sub-Castro church. The Martyrs’ Memorial, built in 1901, stands starkly on Cliffe Hill. The postcard was advertised for sale on ebay in 2013, and attracted competitive bidding. In 1800 the Sporting Magazine was concerned that nets with meshes small enough to catch a sprat were in daily use on the River Ouse, where there had in recent years been “a great number of salmons”. 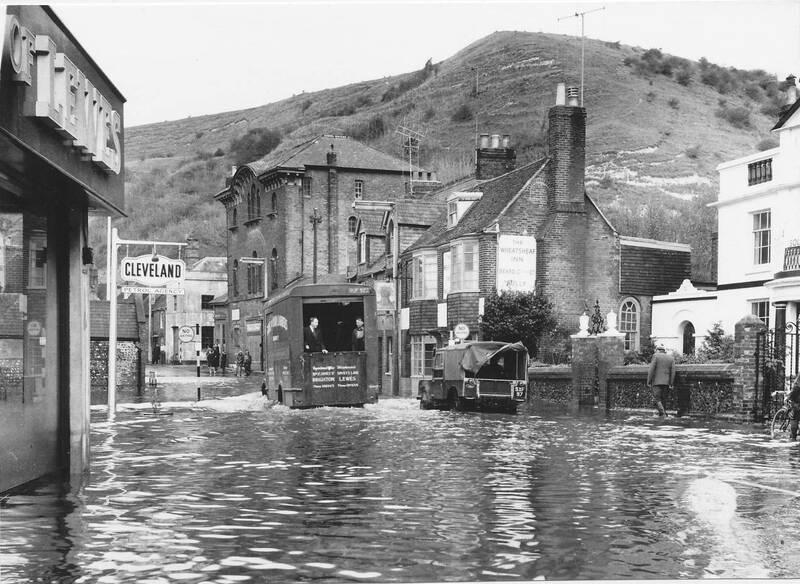 The correspondent urged the water bailiff to stop the use of “these destructive engines on the finest river in the kingdom”. 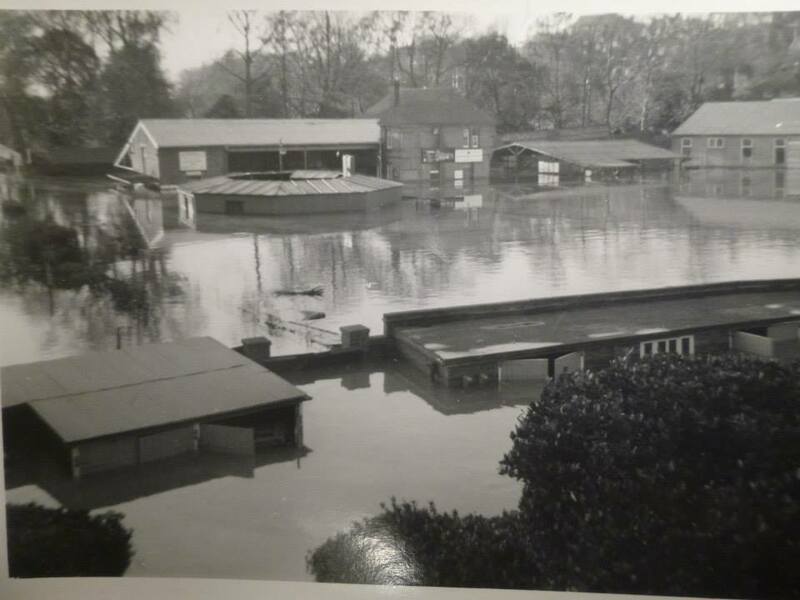 This show, to raise money for Lewes Victoria Hospital, will be on Sunday 14 September 2014, to mark the 50th anniversary of the racecourse closure. 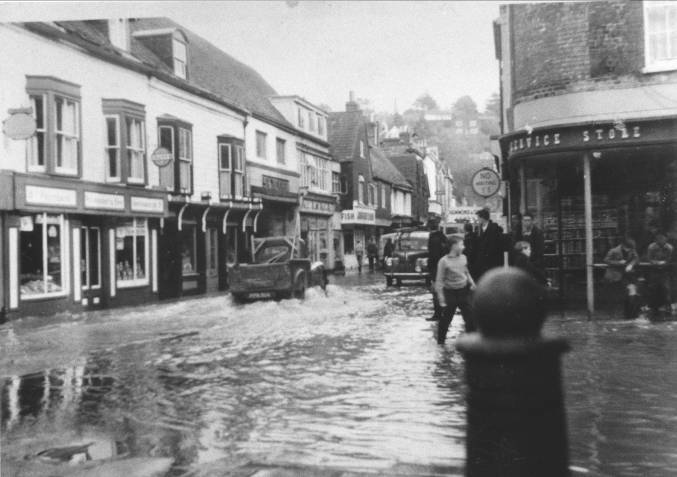 Pre-1964 cars and bikes are being sought to include in the parade from North Street to the racecourse. For more details contact Barry Foulkes, [Information removed 20.3.19 at Barry Foulkes’ request]. I am sorry to report that Lady Alison Jolly, the lemur expert who spoke at our Christmas meeting about Lewes History for children, died in February. Her talk to us was her final public lecture. 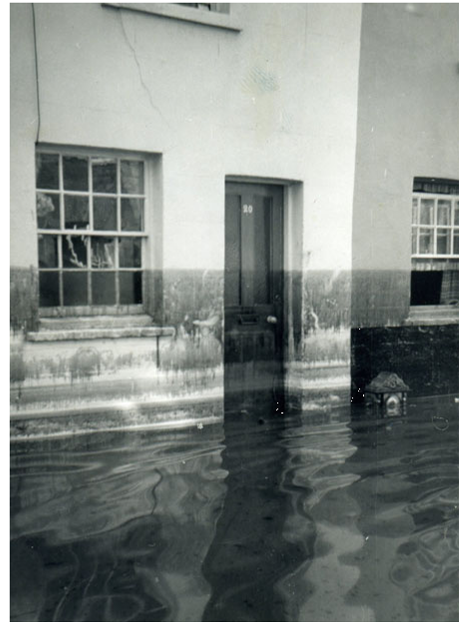 This entry was posted in Biographical Literature, Ecclesiastical History, Environment History, Lewes, Local History. Bookmark the permalink.